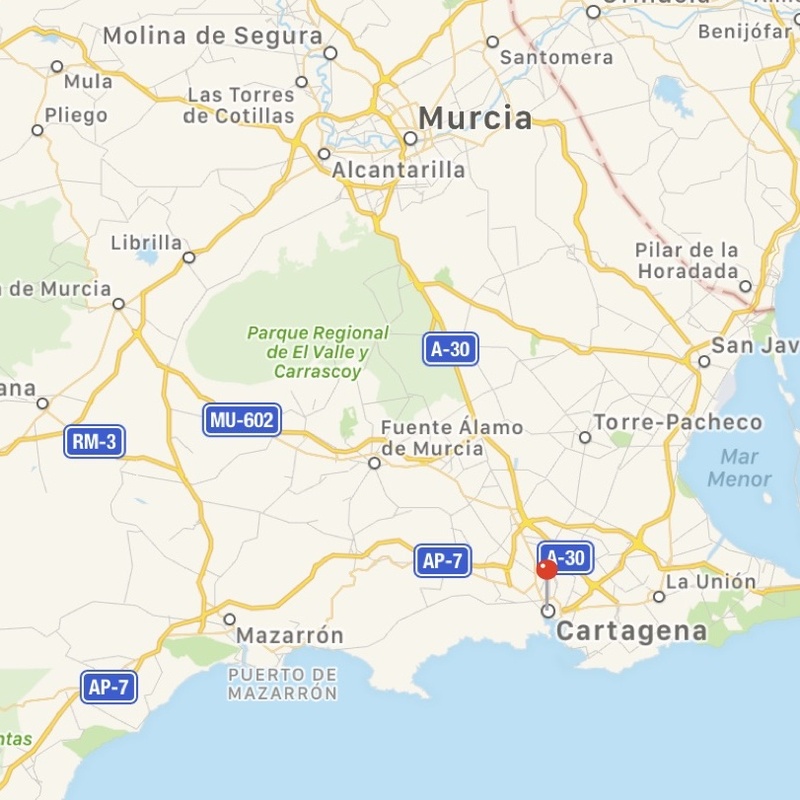 The city of Cartagena is often overlooked by holidaymakers, the majority of which spend their time in the established resorts long the coast of the Costa Calida, Costa Blanca and Costa Almería. However, this compact city, has a lot to offer with a nice harbour, several museums, a Roman amphitheatre and an old town in which to wander. If you are on holiday in the region or own a holiday home along the coast, Cartagena is a great day out. Accommodation is good value and there is certainly enough to keep you entertained for a couple of days if you wish to make a weekend of it. Cartagena is a famous port located in the Murcia region, in the South East of Spain. The city benefits from a natural harbour, which led to the selection of Cartagena as a key naval base during the last 200 years. Modern Cartagena is still has a busy port and is now utilised by cruise ships on a tour of the Mediterranean. The city is also well regarded for servicing of ships and a number of well established companies are located around the harbour side. To this day Cartagena remains an important naval port. The city is built on 5 hills, one of which is occupied by the castle, which overlooks the harbour and the old town. The city centre is pretty compact. The old town has many narrow and pedestrian streets and runs from the harbour side past the Roman amphitheatre and around the castle on the hill. Calle Mayor is the main spine of the old town and is a nice pedestrian street which starts at the Plaza del Ayuntamiento (Town Hall Square) and runs up away from the harbour. There are plenty of small shops, bars and restaurants along the way. 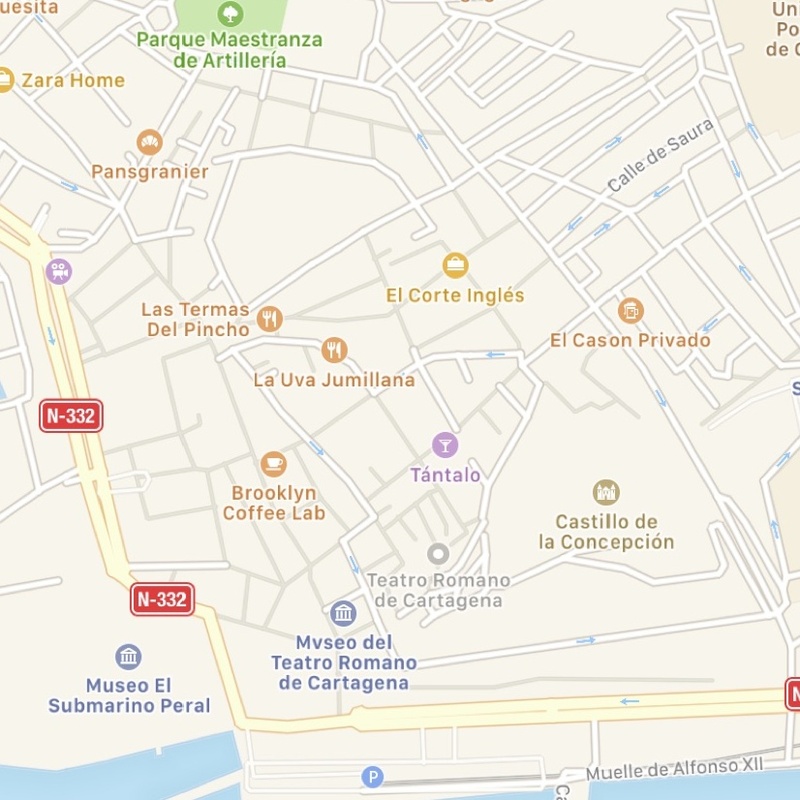 A further 10 minute walk brings you to the main shopping area of Cartagena. Here you will find all the popular high street stores such as Zara and El Corte Ingles. For a relatively small city, Cartagena is blessed with quite a number of attractions. There are several museums, art galleries, castle and the famous Roman amphitheatre. A good place to start if you are unsure of what you want to see is the Plaza del Ayuntamiento. This is a stones throw from the harbour side, where there is underground parking. You will find the main Tourist Information in the town hall. The entrance is in the corner of the building facing the harbour. From the Plaza del Ayuntamiento you have easy access to the Roman amphitheatre, the pedestrian streets of the old town, the castle and the harbour. 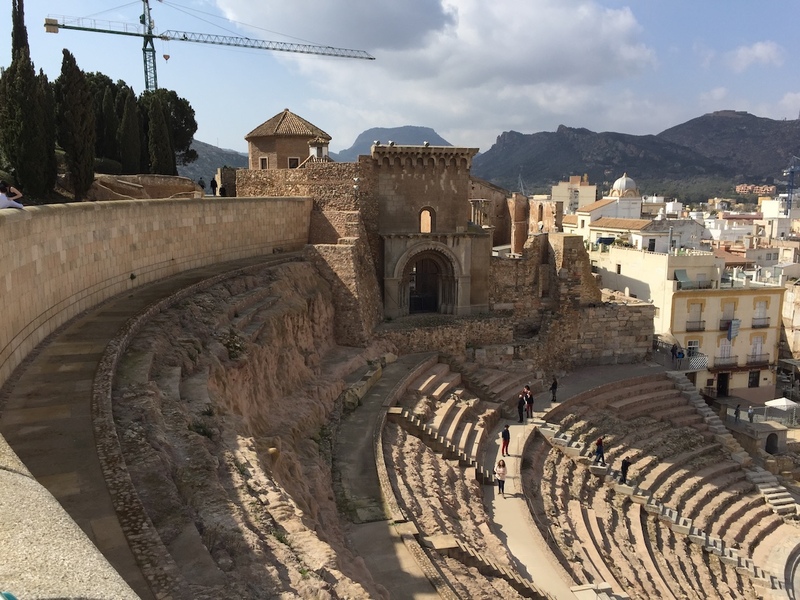 Possibly the most striking spectacle in Cartagena is the Roman amphitheatre. The entrance is opposite the town hall in the square. The museum building itself is impressive, as whilst learning about the Roman influence on the area, you travel beneath the street between the town hall square the amphitheatre. The museum eventually leads you out into the remains of the amphitheatre itself. The museum is closed on Mondays. Entry is €6.00. The castle is located on a hill above the remains of the Roman amphitheatre. Its elevated position ensures an amazing view of Cartagena and its natural harbour. 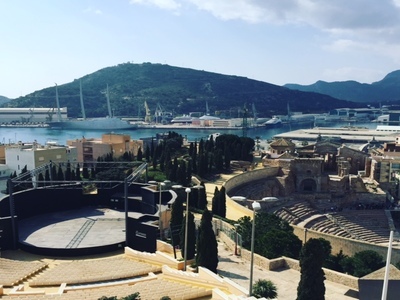 You can take a great photograph with the city, the Roman amphitheatre and the harbour from here. If you do not wish to walk up to the castle, there is a lift from street level. You can wander the castle remains and also visit the museum. This museum as you might expect is located by the harbour side on Paseo de Alfonso XII. The museum occupies a modern building and includes a large collection of exhibits and reflects the maritime history of Cartagena. The naval museum is situated a 5 minute walk along the harbour from the National Museum of Underwater Archeology. The museum building dates back over 200 years. 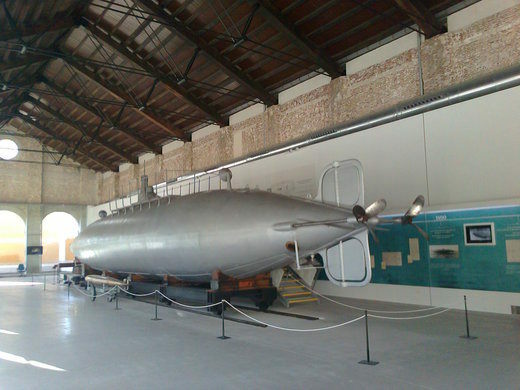 The proud centre piece of the museum is the submarine built and designed by Isaac Peral. He is credited with building the first electric powered submarine. The submarine was launched in 1888 and now stands on display in the museum. 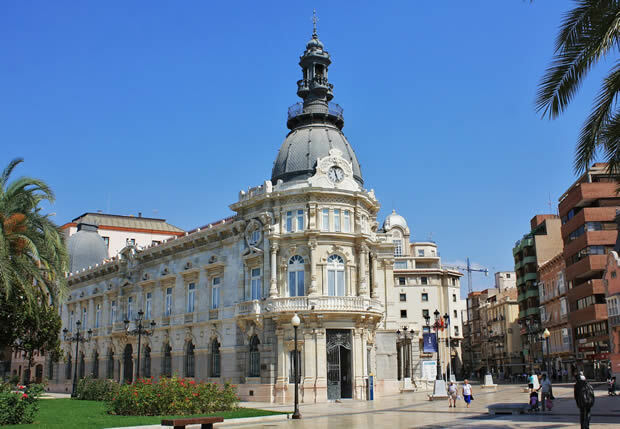 During the Spanish civil war 1936-1939, Cartagena was subjected to a barrage of attacks from Franco´s forces, as the city was the main navy port for the Republican government. This small museum was previously an air raid shelter and now displays some of the history of the suffering inflicted during the war. As with most Spanish cities there are a number of annual events and festivals. The first big festival of the year is the annual Carnival in February. This vibrant and colourful event takes over the city with parades and entertainment in various locations. Some events are ticket only, so check in advance if you plan to visit. Easter Week (Semana Santa) is a big occasion throughout Spain. There are processions through the town organised by the four different brotherhoods. You can purchase seats to gain the best view or just stand in the street along the procession route. La Marquesita (lamarquesita.net) is a modern Spanish restaurant serving a variety of popular dishes. The prices are a little higher than average, but this is reflected in the quality of food. La Catedral (lacatedralcartagena.com) is a popular restaurant which you cannot miss if you visit the Roman Amphitheatre. The restaurant is located immediately outside the exit. The food is modern Spanish with a range of salads, meat and fish dishes. El Trovador (restaurantetrovador.es) is located a little way outside the centre of the city. It is very reasonably priced and has a varied menu. Cafe lab (www.cafelab.es) is a innovative and modern take on a coffee shop. It is located in a suburb outside the city centre. There are sister cafes in Murcia and Alicante. If you like bar hopping with tapas, head for the area around Calle Jara & Calle Honda. There are a number of bars in close proximity. For instance, Bodega La Fuente specialises in all things anchovy. The old town of Cartagena has lots of small independent retailers. You will find some of the large national chains including El Corte Ingles around the Alameda de San Antón and Calle Jorge Juan areas. There are also two out of town shopping centres. There is a choice of accommodation in the city and the area. If you are a family, an apartment makes good sense. Both Airbnb and Wimdu have a good selection. Alternatively, you may prefer a hotel. There are a number of large chain hotels on the outskirts of the city. About the best is NH Cartagena. In the centre you will find some aparthotels and Hotel Los Habaneros is very well located. Cartagena is located on the South Eastern coast of Spain. The closest airports are Almeria and Murcia-San Javier. Many visitors come on day trips from Murcia and Alicante, where many people own holiday homes.